Some hulls, like this powercat, require very specific trailer rigs. You’d think that every trailer that came with a boat would be properly rigged and balanced for that boat. And, you’d be wrong. 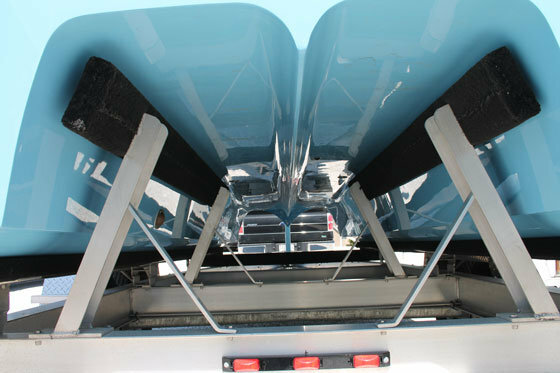 While many reliable builders do go the extra mile to make sure boat-trailer packages are properly matched, many don’t. Worse, when a person buys a trailer separately, they rarely give much thought to whether or not the two fit together correctly, or if the rig could eventually damage the boat. Are your trailer and boat a match made in heaven? Here are a few key points to look for. 1. Weight and Balance – Unless you don’t mind dumping your boat onto the side of the road at 60-mph, you need the rig’s weight distribution to be correct. Tongue weight is the key – it should be 10 to 15 percent of the rig’s total weight. To find out if it is you can put the jack stand on a scale, but if it’s out of kilter there’s a good chance you’ll know the first time you tow it – improper tongue weight is often what causes swaying. To change tongue weight, you need to adjust how far forward or aft the boat sits on the trailer. 2. Support – Generally speaking, more support is better. Bunk trailers usually provide plenty, but roller trailers can deform the hull over time, if they don’t offer sufficient support points (in the appropriate areas). This is a tough problem to spot, until it’s too late; if there’s any doubt in your mind, the best move is to go directly to the manufacturer and get their advice. 3. Capacity – Towing a boat on a trailer that’s at or near capacity is a bad idea. First off, the weight calculations of a boat are not always 100-percent accurate. Secondly, some boats gain weight with time, either due to water saturation in the foam or simply being over-loaded with gear. And finally, consider the weight of fuel. If your boat has a 100-gallon tank, its towing weight can change by over 600-pounds depending on whether or not you’ve filled the tank. Obviously, this is a significant difference and could push some rigs over capacity. As a general rule of thumb, your trailer should be able to haul at least 10 or 15 percent more than the boat (and motor) weigh. A twenty percent margin or error is better. Bonus Tip: If you buy a used rig, always check side guide-ons to make sure they center the boat properly; never trust that a previous owner got the job done right. Also check strap/cable capacity, tire capacity, and jack-stand capacity, as well as overall condition – you may be surprised at how many people fudge the numbers, especially if they didn’t trailer the rig often.